Christmas blackwork - great for coasters or Christmas cards these designs will get you in the festive mood. Quick to stitch coasters include an angel, a bell, a cute robin with a red breast and a partridge in a pear tree. 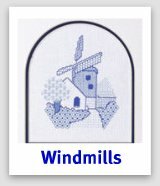 Blackwork Windmills - A set of three small designs based on different types of windmills. Worked in blue threads reminiscent of Delft china. 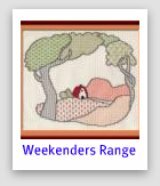 Weekenders - for those with limited time, range includes a Clarice Cliff design, a blackwork butterfly in red, a tortoise, a snail and a pretty calla lily (worked in white thread on black fabric for a stunning effect). 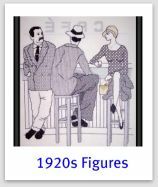 Blackwork figures - from the 1920's and 30's. Best sellers! 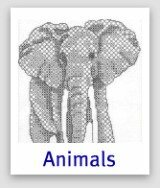 Blackwork Animals - Portraits of an elephant, a rhino, a goose and a rooster. The rooster is suitable for a beginner to blackwork, while the others use shading techniques to bring them to life. 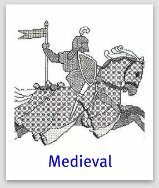 Medieval blackwork - featuring a knight on horseback and a demure medieval lady. 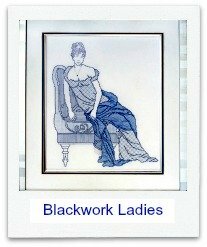 Blackwork Assisi Embroidery - a new twist on a traditional style of embroidery. 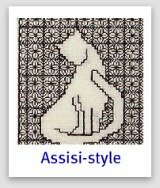 Stitch blackwork cats, dogs and swans and frame them or make them into needle cases. 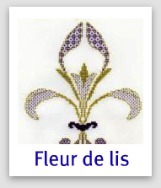 Blackwork flowers - Floral portraits of a rose, a fuchsia, a waterlily and irises. 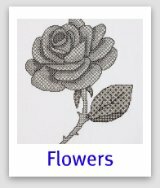 Various shading techniques are used in these blackwork flower patterns to add depth to the designs. 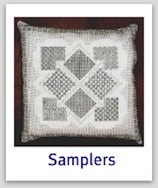 Blackwork Samplers - Can be made up as cushions (or pillows) or framed for the wall. 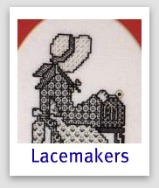 The samplers range in size from the blackwork chess board at almost 17 inches square down to a little blackwork pincushion at just 4 inches square. 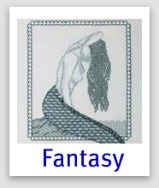 Fantasy blackwork - Stitch a stunning mermaid or glorious oriental dragon in blackwork. The mermaid, Marina, uses wonderful hand-dyed threads for her tail and the sea. The dragon is resplendent in red, gold and black. 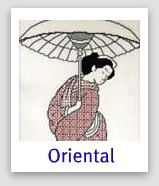 Oriental blackwork ladies - Coloured blackwork designs with an Eastern theme. Work the Japanese Lady in turquoise and silver or Keiko, the Geisha girl, in red and gold, then add a sprinkling of beads. 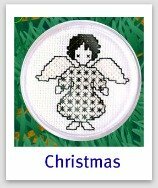 Celtic cross stitch patterns illustrate the four elements - earth, fire, water and air. 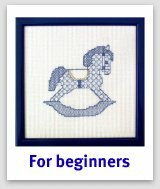 Baby cross stitch patterns - Stitch a gift for a new baby. 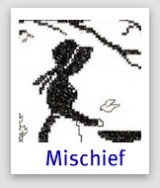 Cross stitch dragons - download only - Old Smokey and his friend the wizard are having a great time! While in Magic Moments the boy dragon serenades his girlfriend with music and a rose. Textures to dye for - Delightful little needlepoint patterns using textured stitches and over dyed threads.